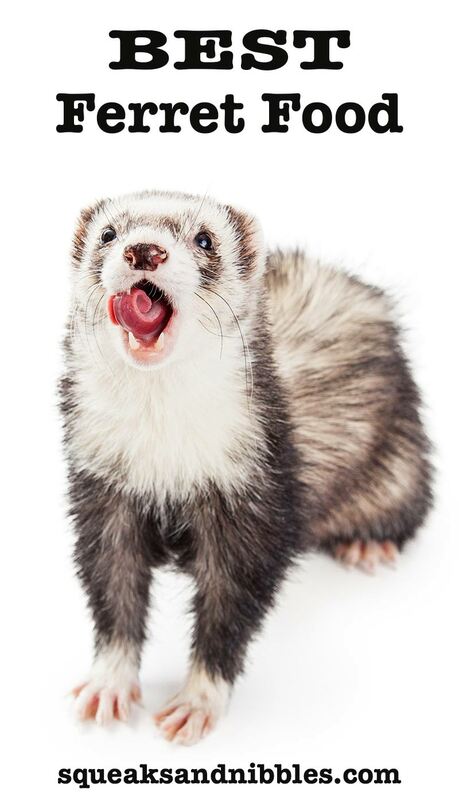 Welcome To Our Complete Guide To The Best Ferret Food. Helping You To Choose The Right Meal For Your Favorite Furry Friend. We love our ferrets for their wonderful characters, cute faces and loving natures. Yet for some reason, ferrets are not the most common pet. This means that when it comes to feeding ferrets, things can get a little stressful. When there just aren’t that many of them out there, how do you what to give them for dinner? We’ll look at these in more detail below, along with some other popular options. I grew up looking after ferrets, and I have a major soft spot for them. These cute critters will eat pretty much anything you let them get their paws on, but it doesn’t mean that it’s all going to do them good. So, for anyone asking ‘what do you feed ferrets’, in this article we’ll take a look at your options! And we’ll start by going back to nature. Ferrets are carnivores. In the wild they hunt and kill their food, surviving only on meat. The diet that would be closest to their natural one is one of raw meat. A ferret’s food would consist of any smaller animals it might come across day to day. Despite it’s benefits this can be expensive and impractical for a lot of people. Dry food is not as close to your ferrets diet in the wild, but is much easier to store in bulk. Dry food also has the potential advantage of containing vitamins and minerals that may help to keep your pet healthy. Because they subsist on meat alone, ferrets have very short digestive tracts. Food moves through them really quickly and they need plenty of easily digestible protein and fat. What can you feed ferrets, then? And, what makes the best ferret food? 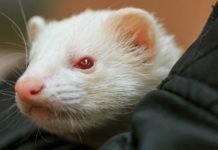 A study published in ‘Veterinary clinics of north America’ explains exactly what ferrets need in their food. Dry food should be at least 15% fat and 30% protein, and no more than 30% carbohydrates. To answer the question ‘what is the best ferret food’ we need to find a food that fits these parameters. We’ll also take a look at what potential risks some foods may pose. It’s important to point out that any new food should be introduced gradually. Most foods reiterate this on the packaging, but it should be applied to all new foods. Completely changing your diet in one day would make you feel a bit funny, and it would probably upset your ferret’s stomach too. Let’s first take a look at some ferret food by Marshall. 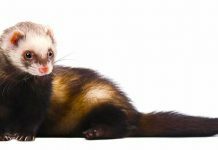 The popular Marshall ferret food boasts complete nutrition, and markets itself as a premium ferret diet. This food ticks all the boxes nutrition wise. There’s plenty of protein and fat and a fairly small amount of carbohydrates. This food also contains omega 3 and 6 fatty acids. Polyunsaturated fatty acids could have real benefits for your ferrets heart. There are some really positive reviews on this one, so it’s well worth looking at. 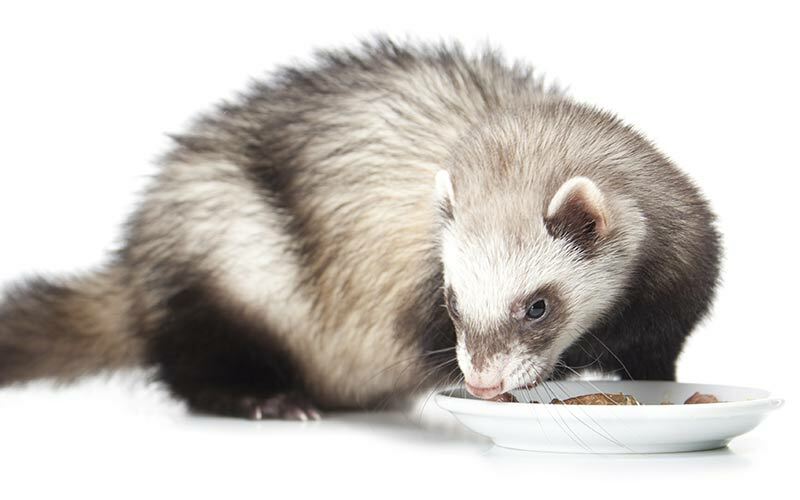 ZuPreem’s premium ferret diet boasts support from vets and breeders, but how good is it really? This premium ferret food contains 40% protein and 20% fat, reaching our acceptable levels for good ferret food. The second highest ingredient is wheat flour, however, which is a cause for concern. Flour is almost all carbohydrate, but the protein and fat level in the food means that it wouldn’t meet that 30% mark. The reviews are stellar on this one, the vast majority of people seem to really like it! Let’s move on and focus on Kaytee ferret food. Kaytee are a household name, selling everything from cages to bird feed. How does their ferret food hold up to scrutiny? Let’s take a look at the Kaytee Dry Ferret Food. This high protein and fat food is grain free, helping prevent an overly starchy diet. This food is also available as an identical-formula turkey based food. This means you should be able to switch between these two options with less risk of a stomach upset. More variety in your ferrets life! Kaytee also produce a range of wet ferret food, also grain and gluten free! Because it’s wet food, the vast majority of the weight is water. With this being said it still has the proper balance of nutrients. Natural gold ferret food is another departure from the all-chicken recipe. This food mixes poultry with pork and fish. This food has a great amount of protein and fat, and very little in the way of carbohydrates. In other words, it’s great news for your furry friend’s digestive system. This food also contains immune system maintaining nucleotides. This ferret food by Wysong consists of an impressive 60% protein and 18% fat. The first four ingredients listed on the packaging are chicken products. This is a big plus because it means a substantial amount of the foods mass is meat or offal. Since a ferrets natural diet is all meat, this is something to shoot for. They also do a raw ferret food option. Wysong Raw Ferret Food comes in three different flavors. Chicken, quail or rabbit. This starch free, meat based ferret food is designed for optimal nutrition for your furry little friend. Another option is to raw feed your ferret at home. We’ve talked a lot about packaged food, but what about going back to your ferrets roots? Raw feeding is definitely the closest to a ferrets diet in the wild, but the meat you give your ferret will be quite different to what it would find in nature. Most ferret foods are chicken based, but any other nutrients your ferret might need are added in. Your ferret would probably get these in the wild by eating lots of different animals, and entire carcasses. It’s likely that just feeding raw chicken meat wouldn’t be varied enough. Supplementing your ferrets food with raw meat can be great, but talk to your vet before switching diets completely. Raw could be the best ferret food, but it’s hard to get the nutrient balance right, tricky to store and raises some hygiene issues in terms of preparation. 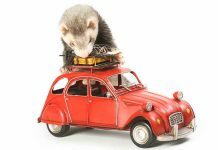 If you have a cat at home, you have probably noticed that your kitty and ferret have some similarities. But does this extend to their diet? Is the best ferret food actually your cat’s dinner? Cats and ferrets are both carnivores by nature, so their dietary requirements are quite similar. For example, both require taurine in their diet to stay at top health. Taurine is only found natural in animal tissue. When it comes to a cat or ferret diet, food can be approached in much the same way. As long as we apply the same nutritional standards, you can use premium high protein dry cat food for ferrets. Evo ferret food was a popular choice, but it no longer exists. However, they do still make cat food, and as we’ve discussed this can sometimes do as good of a job. Evo chicken and turkey cat and kitten food is grain free. This high protein low carb cat food meets all our requirements for a great ferret food. The ingredients are incredibly similar to a premium ferret food. This could well be the best cat food for ferrets. The same is not true of all cat foods however, you should always check the packaging. But in this case, I can see no problem giving this cat food to a ferret. Dogs are not obligate carnivores like cats or ferrets. Dogs are omnivores and capable eating a much more varied diet than a ferret. For this reason it’s probably best to stick to premium ferret and cat foods with a high fat and protein count, and low amounts of carbohydrates. If you are looking for the best ferret food, stay away from the dog food isle. So, what can I feed my ferret? Well, any of the foods above, really! All of them meet the recommended nutrients, so it’s up to you to choose which one. Although you can see our top five choices in the best ferret food chart at the top of the page. Your ferret might also have an opinion on which of these foods he likes the most! But they’re not often picky. The higher the protein and fat, the more suited to your ferrets stomach the diet will be. Always remember to introduce new foods slowly to avoid any upset. 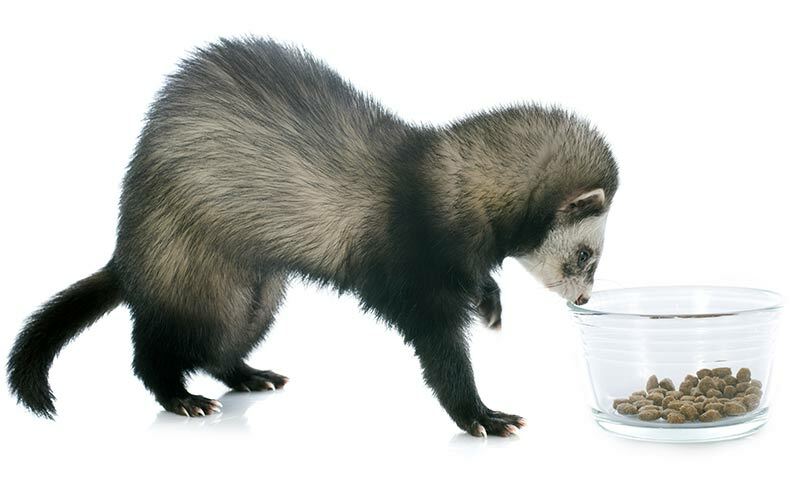 And why not let us know which one you pick as the best ferret food for your pet! Effects of polyunsaturated fatty acids on cardiac voltage-activated K(+) currents in adult ferret cardiomyocytes Xiao Y. F., Morgan J. P., Leaf A. Previous articleCan Guinea Pigs Eat Celery? Next articleCan Bunnies Eat Chocolate? I recently purchased a baby ferret, and I confused that which type of food I feed my pet ferret. Thank you for giving the options to me. You describe nicely, whole the information.